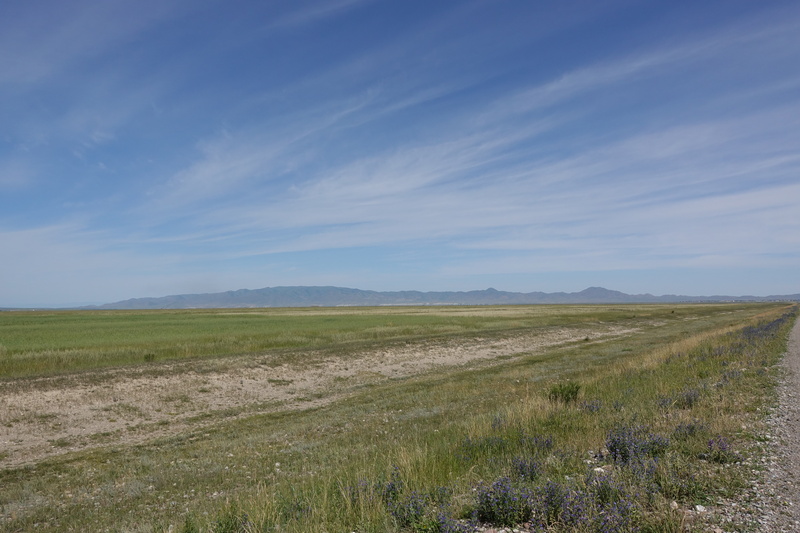 Arriving in Kazakhstan was a bit of a shock to our systems- what we had grown accustomed to in Southeast Asia no longer existed. As we were landing, Cédric and I peered out the airplane window to see that the lush green mountains from northern Thailand were now barren and gold. Stepping out of the airport, we also had to sort through the barrage of people hassling us for taxis to find someone that looked relatively legitimate and had a large enough space to fit our luggage in. As usual, we ignored anyone calling himself a taxi in the terminal, and go through a more genuine looking one: basically, it is either with taxi-meter or nothing. But even with both of us sitting in the car and the boxes in the trunk, one last person tried to tell us that we actually needed a second taxi: one for boxes and one for people… apart from being a ridiculous proposal, there is just no way we would let the luggage in a separate car! It looks like we will have to be more direct and franker in Central Asia. The bike, all set and ready to go! 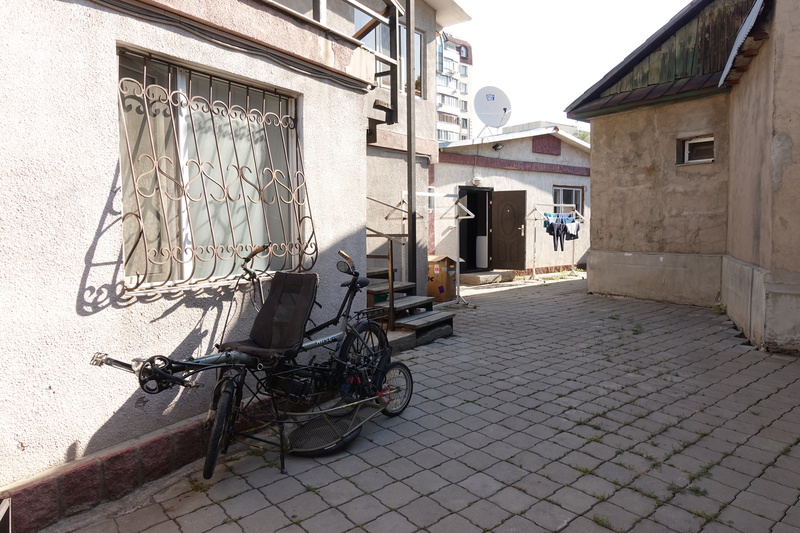 When we arrived at out accommodation in Almaty, Cédric and I took a few minutes to settle in before we began building the bike once again. 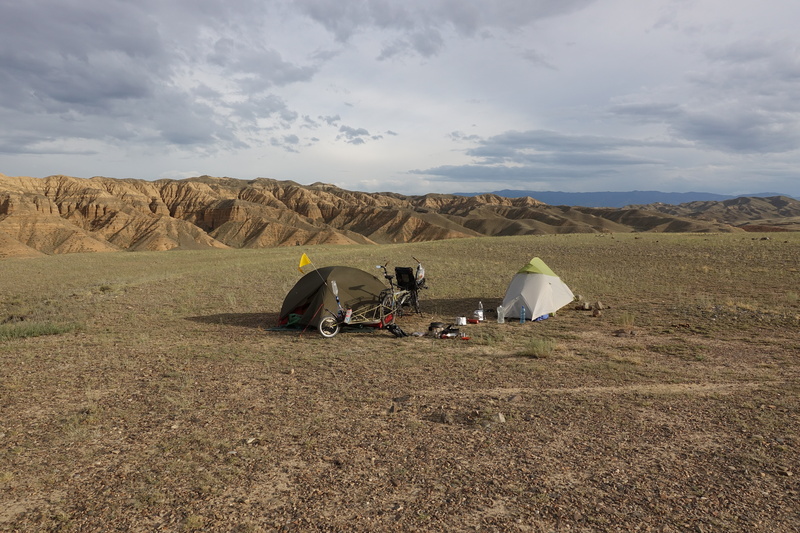 Having rebuilt the bike on three separate occasions during this trip, we felt like old pros and managed to set up everything before night fall. 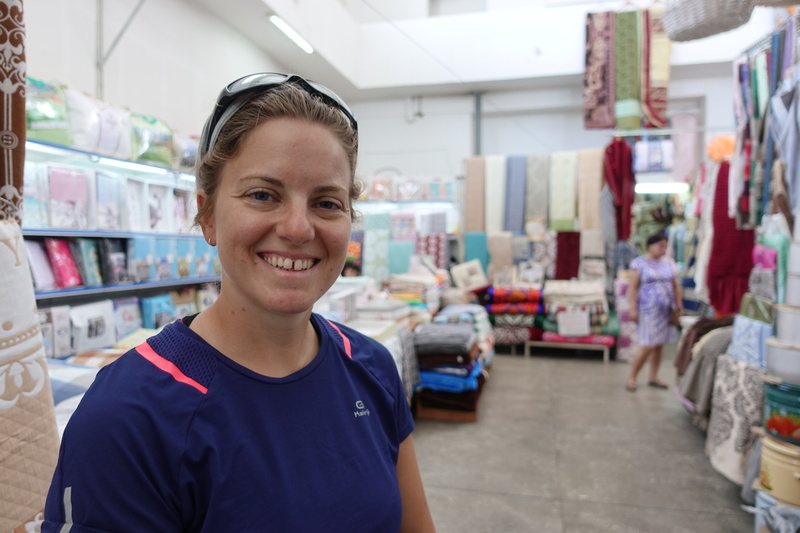 The next day, we set out to explore the city of Almaty and get a few supplies before the next leg of our journey. In comparison to our last two months, the streets in the city were broad and traffic was light. As we were walking through a residential area, I commented to Cédric about how quiet everything was now that there were no more motorbikes and scooters blasting down the streets. Along with the relative stillness, the smells of food and refuse no longer lingered in the air. 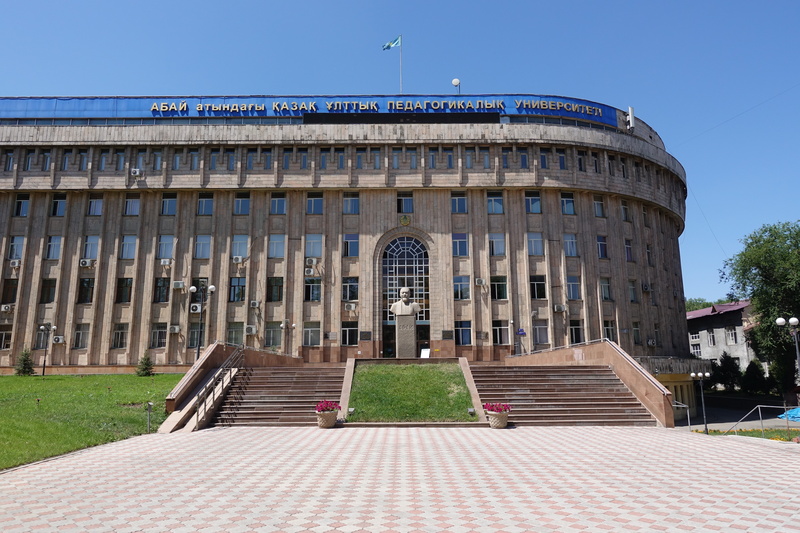 The buildings in Almaty were also very different than what we saw in Thailand: instead of small, two story homes and shops, a lot of buildings were of Soviet magnitude and took up the length of an entire city block. Food also became more difficult to find (or just not as easy) – instead of small restaurants or convenience stores at every corner, we now needed to actively search for places. 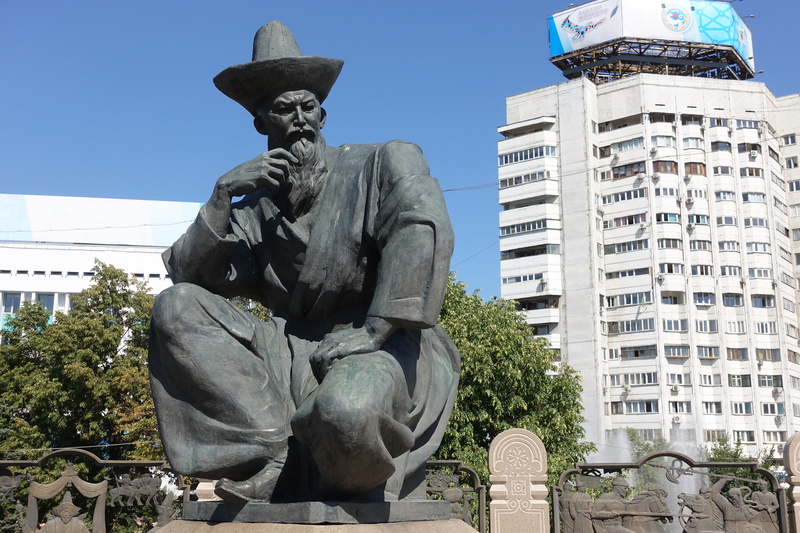 Almaty really felt like being back somewhere in central Europe, for its people (a lot of Russian ethnics, which was a little confusing at first because Caucasian looking people in SE-Asia could speak English! ), also a much wealthier city (clean and organized: there even have separate bike lanes! ), seeing some European brands, and the climate similar to southern Germany in summer (and much drier than Thailand!). 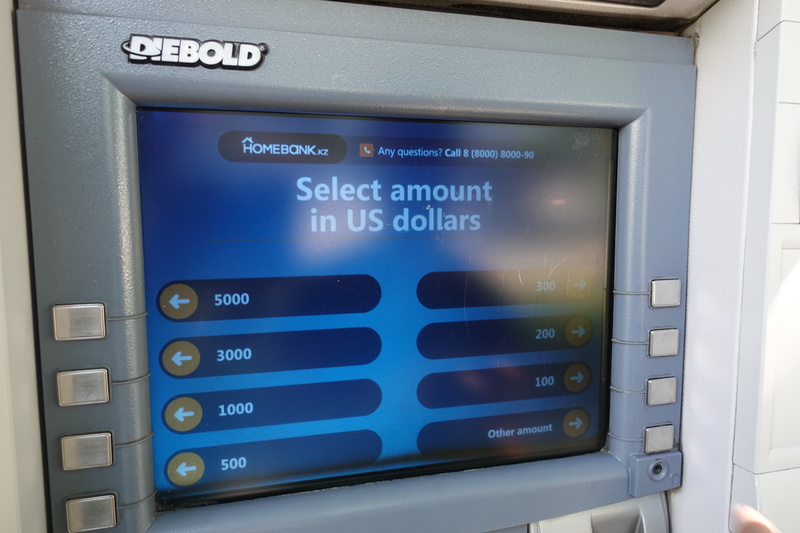 Preparing for money exchanges in the next few countries. No, we didn’t pull out $5000… the machine didn’t have that much. 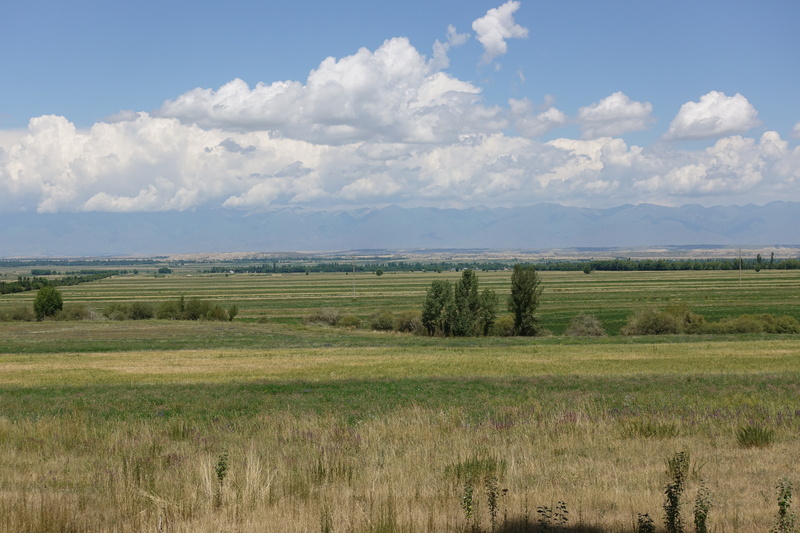 The next day, we set off eastwards in the direction of Karakol. 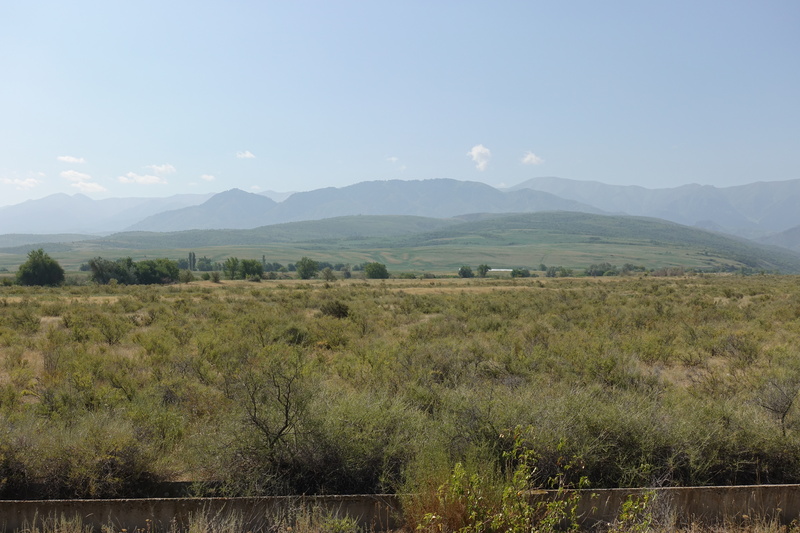 Instead of taking the more direct and flatter route to Kyrgyzstan through Bishkek, we opted for a quieter and more scenic route towards the mountains. 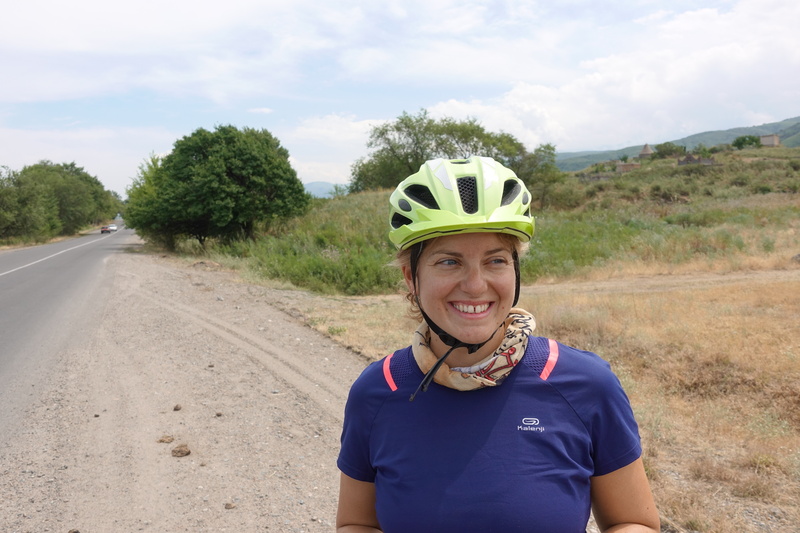 The first day on the road was challenging – since there were no more motorbikes sharing the road also meant for fewer shoulders and faster drivers. The distances between towns also became much greater. For lunch, in efforts to wean ourselves off the abundance of eateries that we experienced in SE Asia, we stopped for shashlik (shish kebabs) in Talgar instead of making lunch. 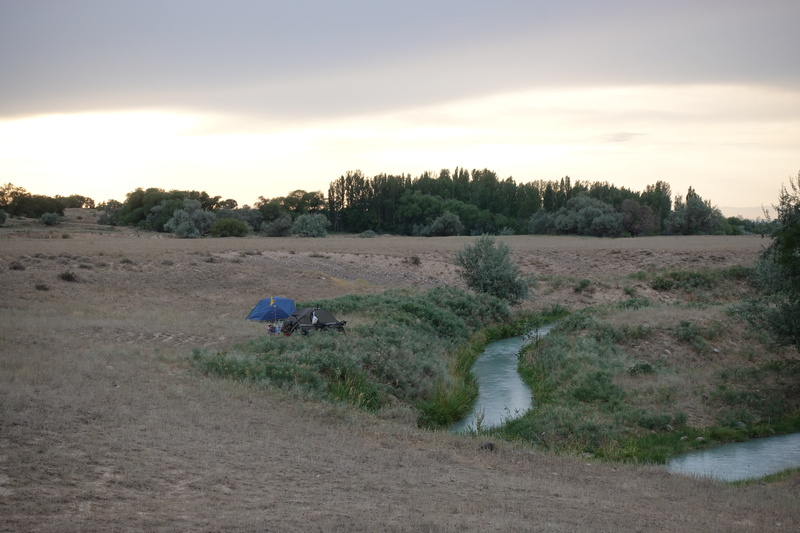 That night, however, we needed to break out the tent after two months of disuse and found a nice campsite in a farmer’s field, with shade from trees and a stream nearby. Instead of cooking noodles, however, we forgot a lighter to start the stove, so dinner became bread and pasta sauce. 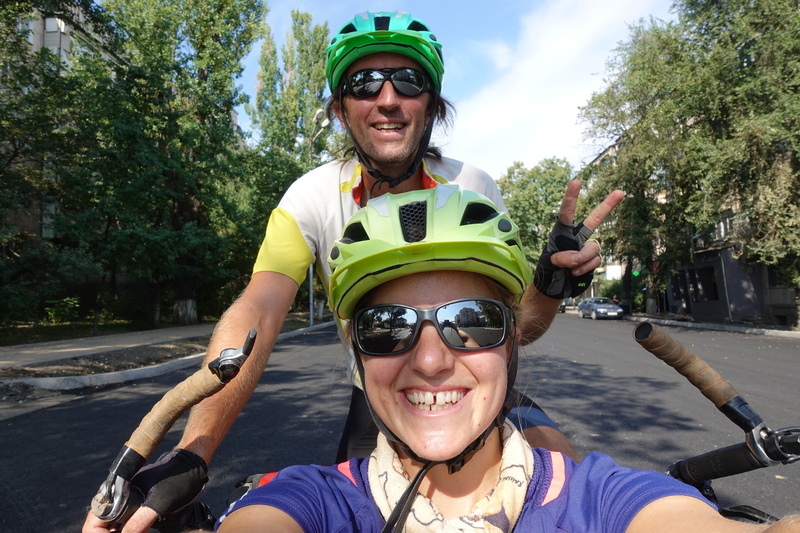 On the bike again and leaving Almaty! 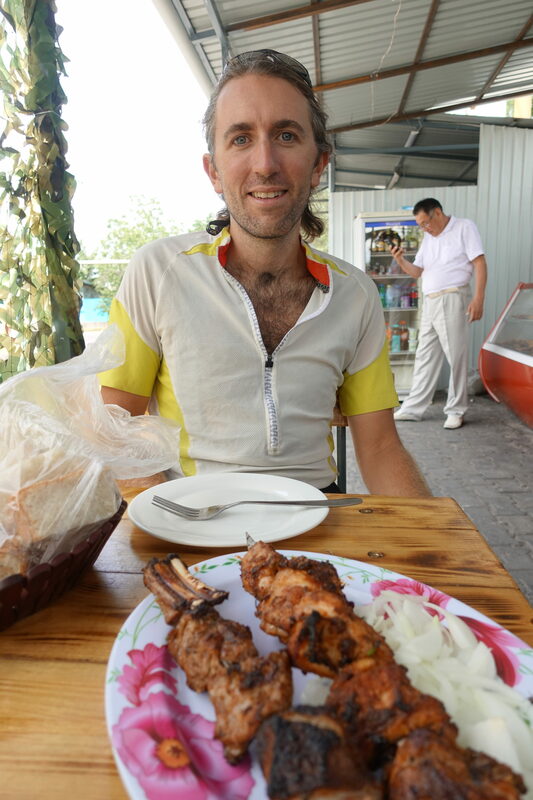 Enjoying our last restaurant meal for a few days… the official Kayakh dish: Shashlik! 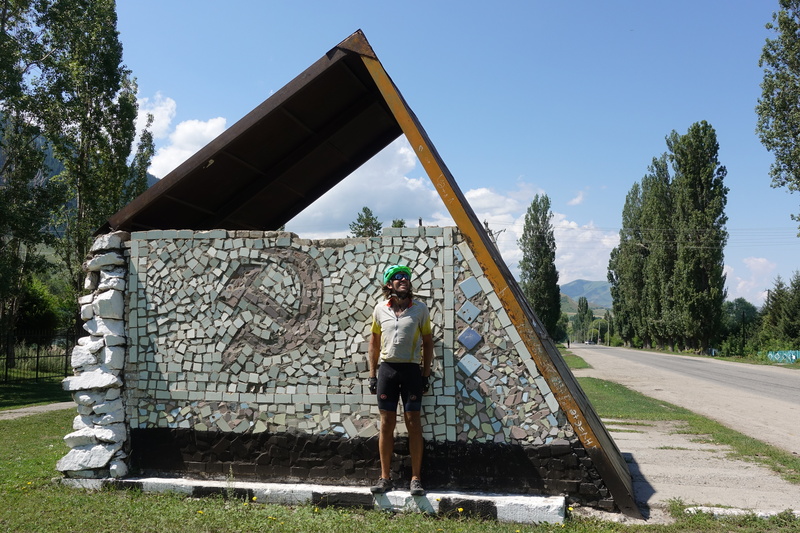 The next day, as we were riding east, we met Roman, a Kazak cyclist who was doing a tour around the Almaty region. 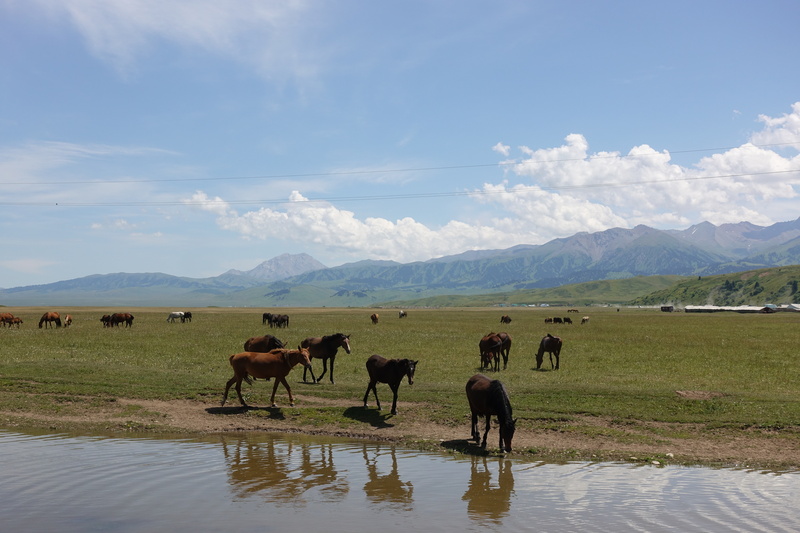 Together, we rode down a desolate road, somewhere between the Tien Shan mountain range and the verdant plains near Lake Kapshagay. For lunch, we stopped in one of the few villages we passed that day to pick up sundries that would hopefully hold us over until the next opportunity for food. 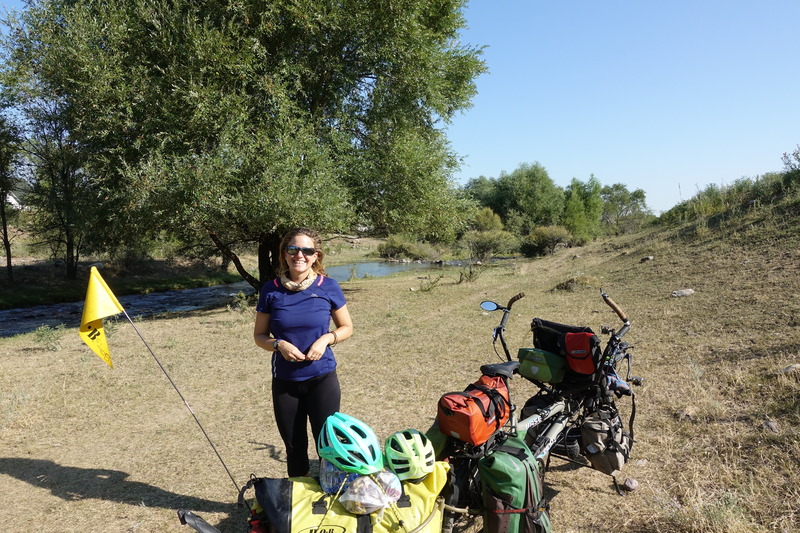 Looking at the small selection in the store was another reminder that cycling and camping would be different in Central Asia. 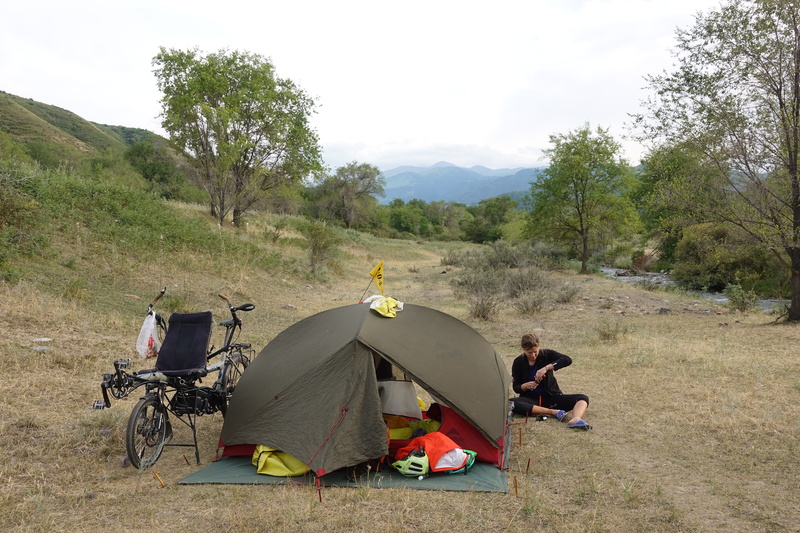 In the evening, we stopped near a canal to camp and as we ate dinner, Roman told us of all the activities to do around Almaty and Kazakhstan. 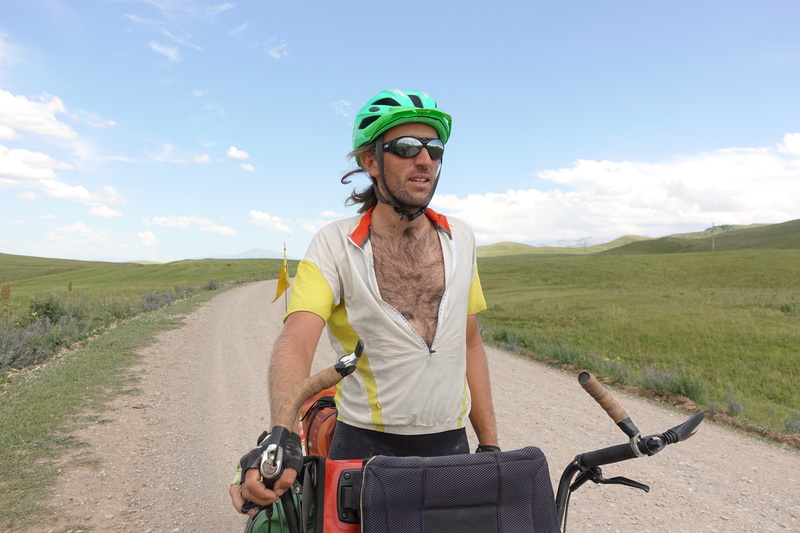 We found a new friend to cycle with – Roman! 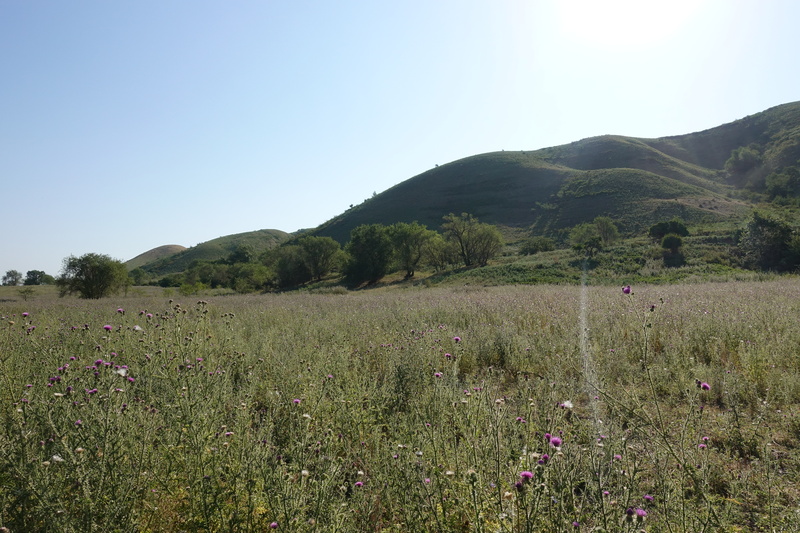 In the morning, we set off for the last few kilometers down the lonely road before we joined the main road towards Kyrgyzstan. 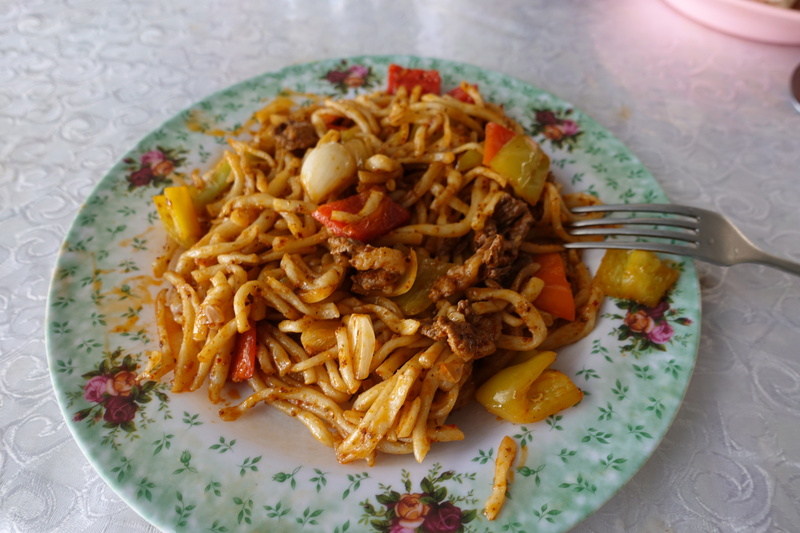 Just as we were starting our long ascent, we stopped at a roadside restaurant and Roman introduced us to lagman – a popular central Asian noodle dish. 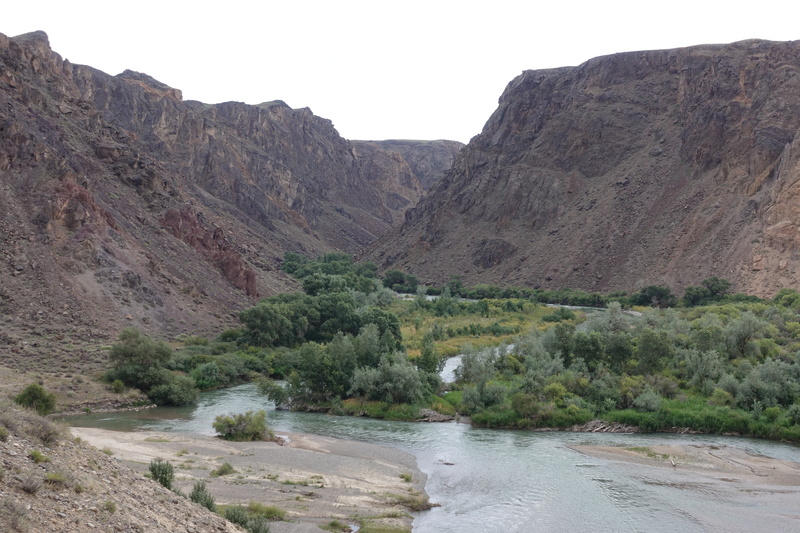 With our bellies full (we got worried that they were a bit too full and feeling funny for the first kilometers…), we pushed uphill through gorges to Kokpek. There, we parted ways with Roman and Cedric and I picked up what we could for the next few meals. 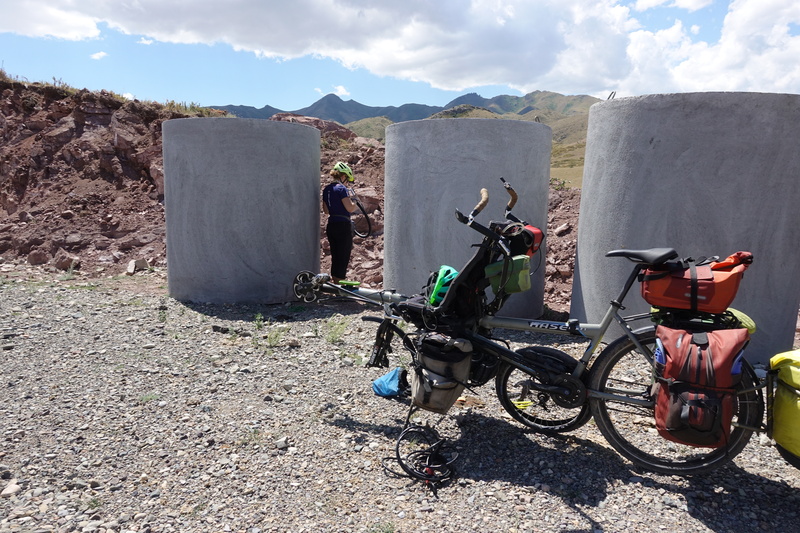 After Kokpek, we cycled 30 kilometers through what seemed like a never-ending steppe and up a mountain pass towards the Charyn River. Along the way, while I was taking a bathroom break, a driver had stopped to offer Cédric kumis (fermented horse milk)- the beloved drink of the region. 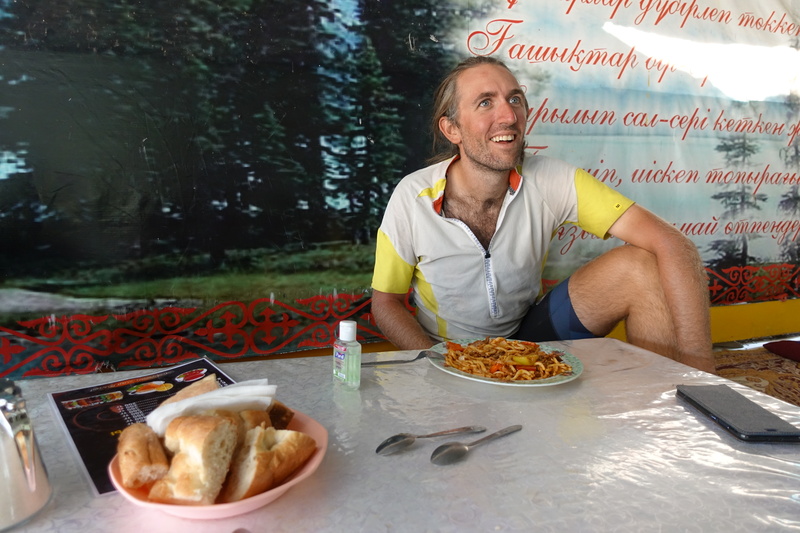 We decided that it was best to save the drink for dinner and continue up the pass without a stomach laden with kumis. 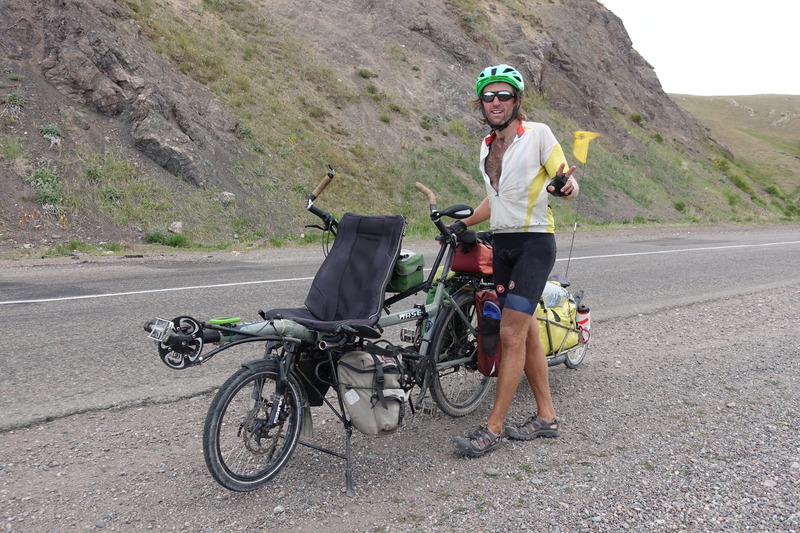 Cycling down from the pass, we met a Swiss cyclist, Chris, and decided to camp together on a bluff overlooking the river. 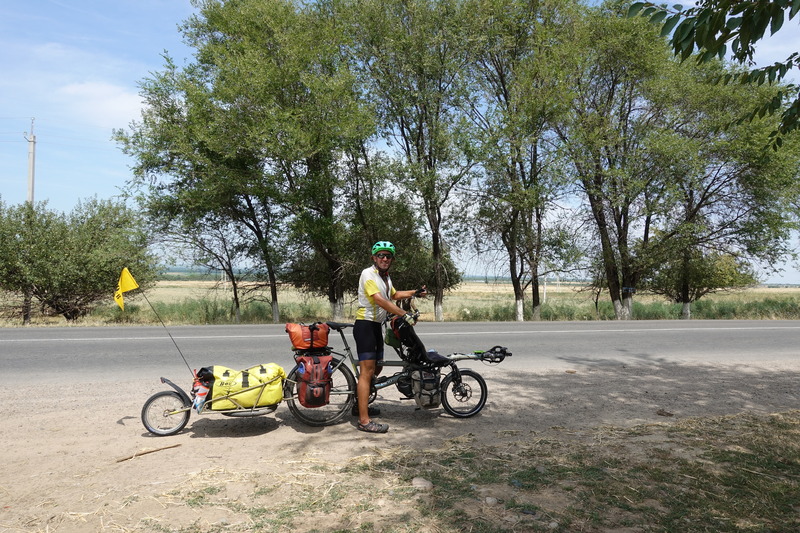 Since Chris was cycling in the opposite direction of us, he was able to give us route and cultural tips for the upcoming months in Central Asia. As he tried our kumis, he claimed that this one wasn’t so bad (Cassie thought otherwise) and there will be more opportunities to accept unexpected gifts from drivers along the way. Ready to leave our quiet road and head into the mountains! Cédric found a new girlfriend – she would follow him everywhere he went. Dogs in Kazakhstan have owners clearly giving them orders… and are thus a lot nicer than their Thai cousins! Breakdowns are common here and many people are well versed in auto mechanics. Note that the ramp for fixing the cars is over 20km away from any house! 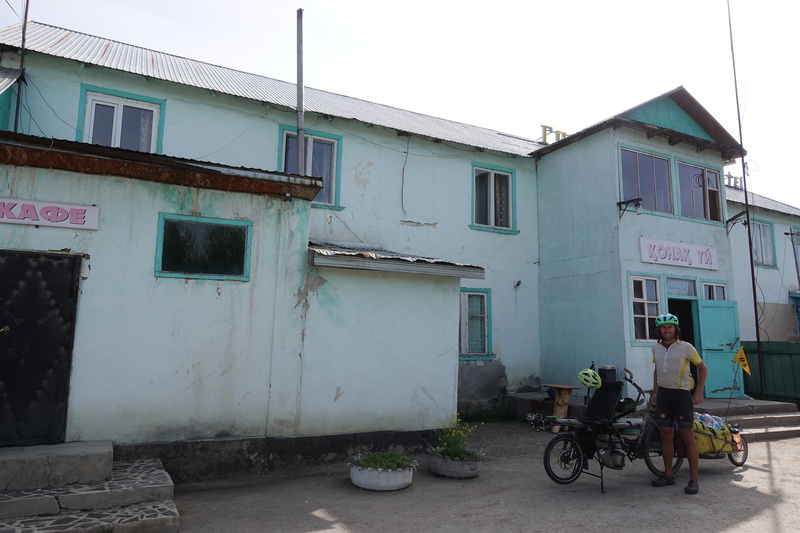 The next day, Cédric and I continued cycling up towards the Kyrgyz border while making a poor routing error with the GPS. What seemed like a newly asphalted road quickly became steep uphill gravel and remained that way for a few kilometers. We also got our first flat tire of the year on that road, thanks to a small piece of sharp metal. Exhausted, as we finished that part of the climb, we sat down to a lunch of ketchup and bread because we were out of food (being used to villages every few kilometers in Thailand really took its toll on us). As we made it over the second pass and cycled down towards Kegen, Cédric and I remarked on how this was the highest point we had been at with a bicycle (2000m) and we only had more and higher passes to go through in the coming weeks. 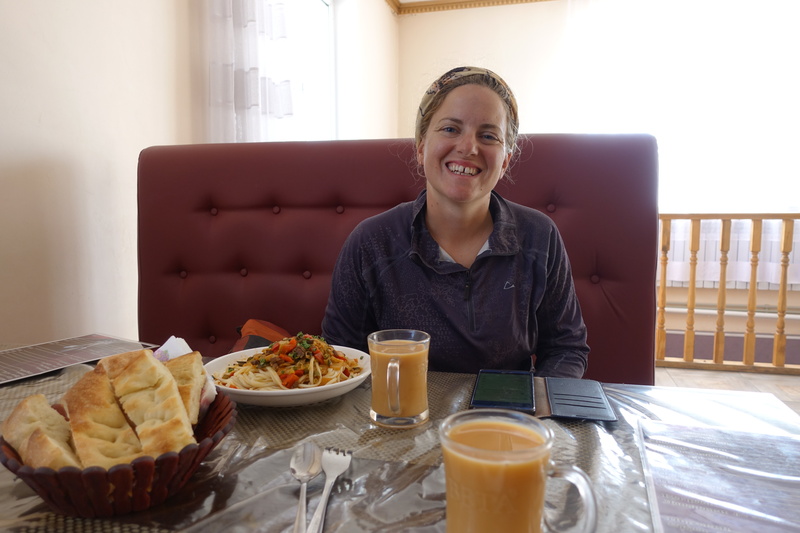 After a night in Kegen, where we visited two separate restaurants for two dinners, we continued in the direction of Kyrgyzstan. 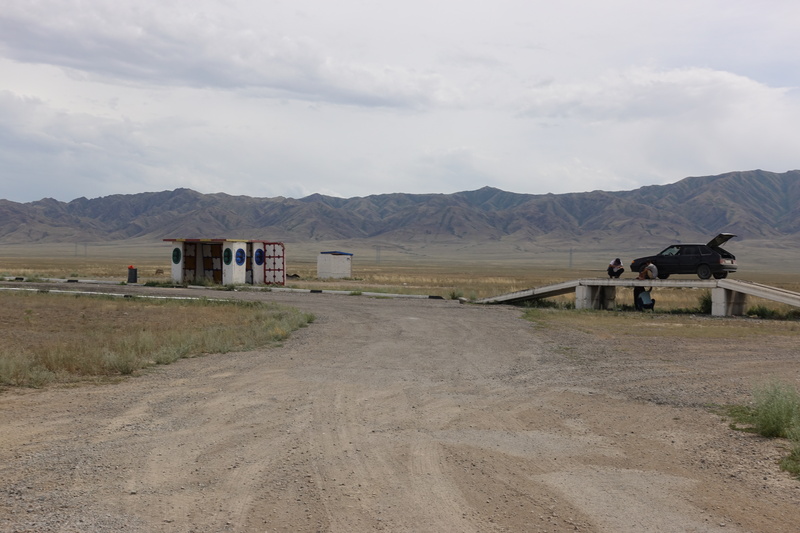 After the very last Kazak village, the road quickly turned into dirt road for the last 10 kilometers until the border. Judging from the machinery, it appeared that there was some type of plan to pave this road, but the few workers hanging out and smoking in the shade of the diggers made it seem like the end date for construction was scheduled for 2045. The border crossing went by effortlessly once the guards figured out that we were carrying more food than contraband. 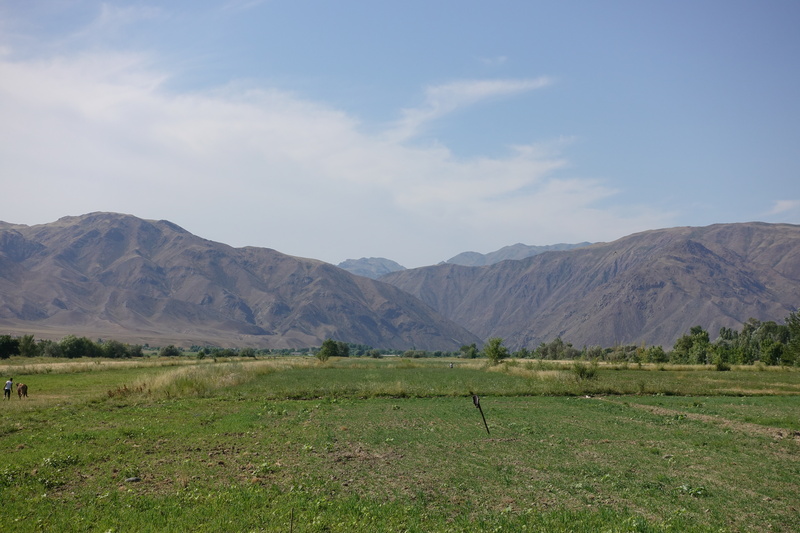 That afternoon, we continued cycling through the valley and along the dirt roads in Kyrgyzstan. As time passed, we began to loathe the car drivers as they blew up inconceivable amounts of dust as they sped past us. 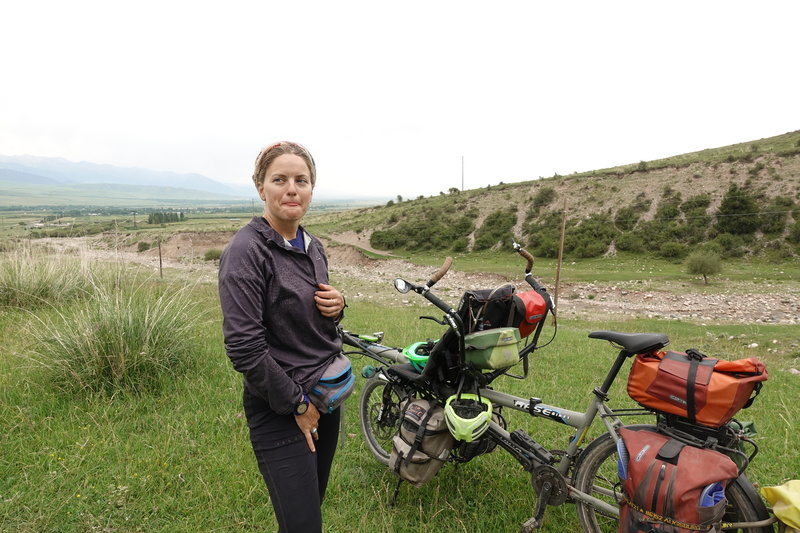 Instead of taking the longer, paved route towards Karakol, we decided on shorter, but steeper route that would take us over a small pass. As we began the climb upwards, the gravel road became even more rough and steep, so pushing became our best option to make it over the pass. 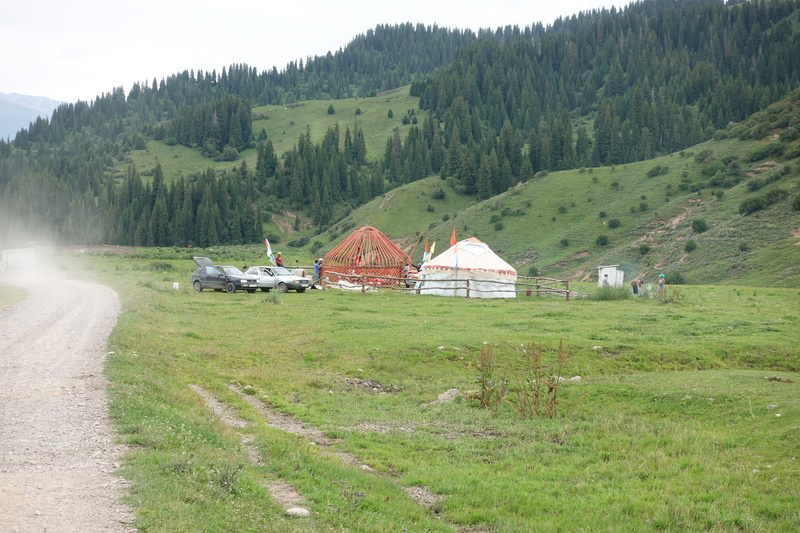 On the other side, the ‘’Jyrgallan’’ valley was filled with horses, cows, and small family yurts. 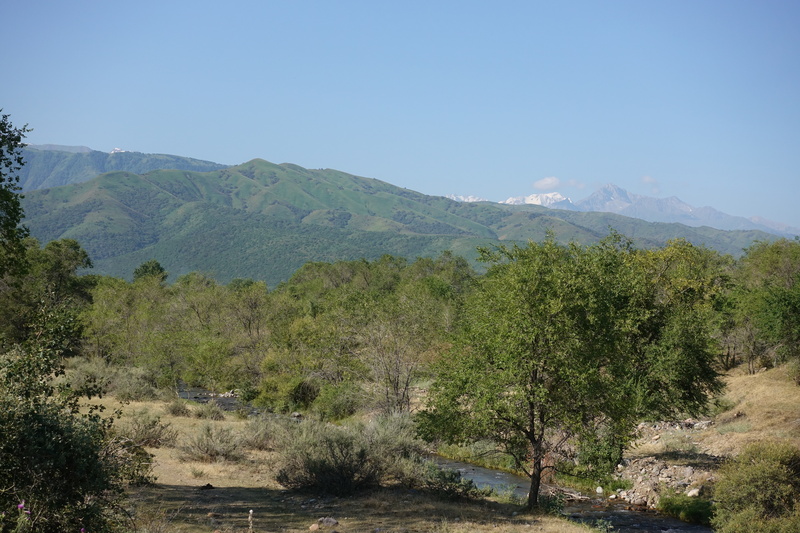 When we stopped to take pictures of a group building a yurt, we were mobbed by a group of 3-4-year-old boys who had seen us off in the distance. They wanted to touch and poke the bike, and some even surprised us by following us for a few hundred meters downhill, sprinting as fast as they could. The evening was spent, hiding from the rain but not much else, because we couldn’t find any well-hidden camping spots. Cédric became the talk of the town while I was buying groceries. People got amazed when looking at the kilometer count of our tachometer – yep we have done a lot more kilometers than the size of Kazakhstan. 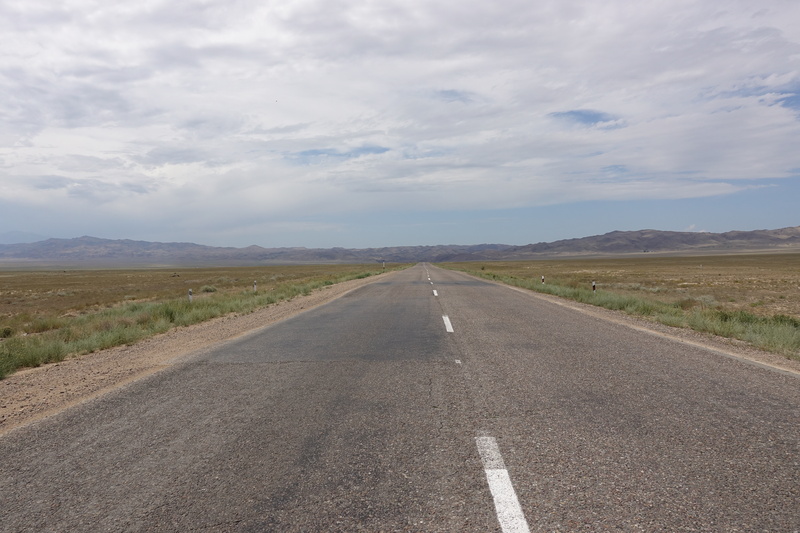 Kyrgyzstan = end of asphalt! 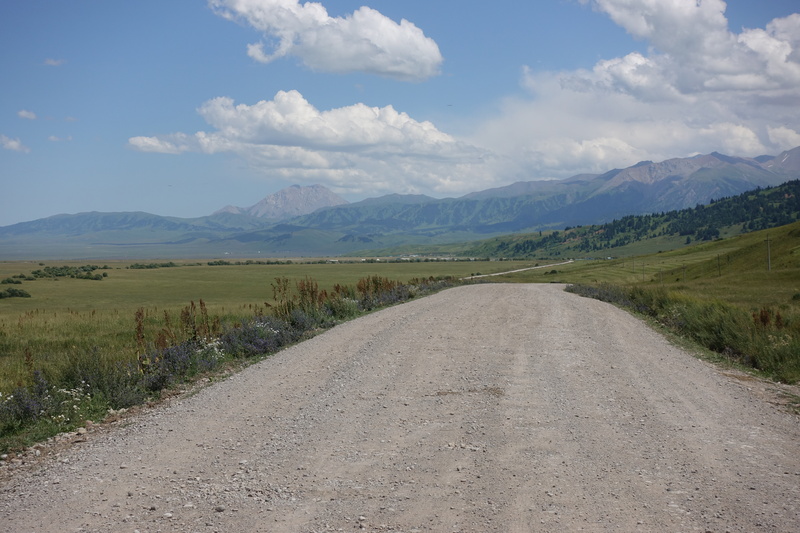 The next day, we continued down the road to Karakol, excited when we once again met asphalt. 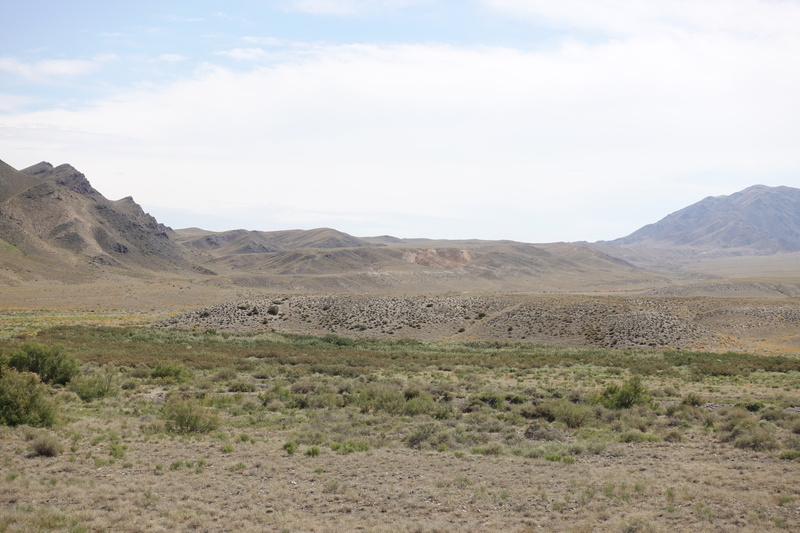 The scenery that we experienced over the first week of our trip was varied and epic. 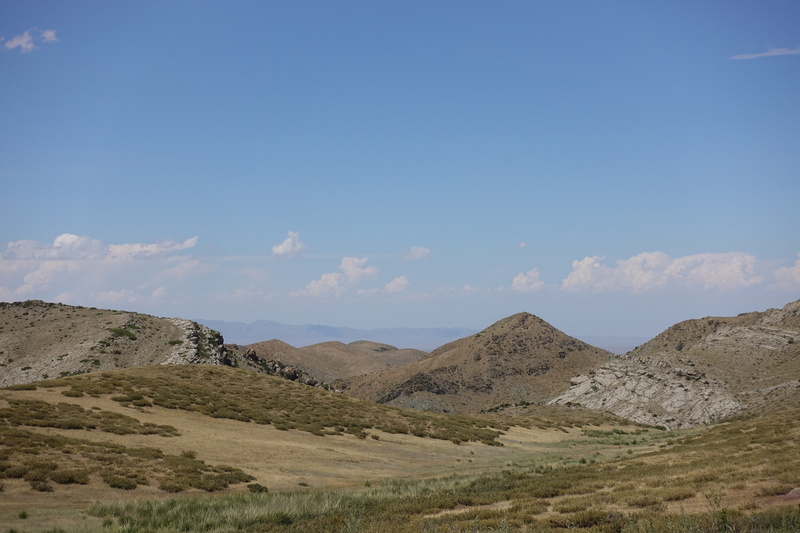 Every pass brought a new landscape, and I often remarked to Cédric how this area reminded me of Argentina, or the Pyrenees, or the Alps, or Morocco… Even if Kazakhstan was very enjoyable, it felt like a warm up ride before heading to the higher, more rugged and tougher Kyrgyzstan. Hey! I have read all your Blog this So Nice and Awesome service you have provided, Full of incredibly useful information and stunning photos. Thank you very much!